Protecting your fingers and hands is important for your work and quality of life. Work-related hand injuries are one of the leading reasons workers end up in the emergency room and miss work. Damage to the nerves in your fingers and hands, loss of a finger, a skin burn or allergic reaction, can negatively impact the quality of your work – or worse – end your career and seriously detract from your quality of life. The cost of these types of injuries and illnesses to businesses is estimated in the hundreds of millions of dollars each year. The most effective and reliable way to prevent problems in the workplace is to design and operate processes to avoid contact with hazardous materials. Employers should take all the steps that could be in place to achieve this before resorting to the use of protective gloves. A task speciﬁc risk assessment needs to be carried out to determine the need for protective measures and to determine what measures are the most reasonably practicable for your organisation. Effective control measures usually consist of a mixture of process and/or workplace modiﬁcations, applied controls and methods of working that minimise exposure and make the best use of controls. Very often this mix includes the use of Personal Protective Equipment (PPE). The ﬁrst step in any risk assessment is to identify the potential hazards and the potential consequences of exposure to these hazards. Potential hazards to hands and arms include skin absorption of harmful substances, chemical or thermal burns, electrical dangers, bruises, abrasions, cuts, punctures, fractures, or amputations. Protective equipment includes gloves, finger guards and arm coverings. Employers should explore all possible engineering and work practice controls to eliminate hazards and use PPE to provide additional protection against hazards that cannot be completely eliminated through other means. For example, machine guards may eliminate a hazard. Installing a barrier to prevent workers from placing their hands at the point of contact between a table saw blade and the item being cut is another method. As outlined in the following sections, there are a number of different hazards that can cause harm to the hands and arms in the workplace. In light of a recently completed comprehensive study, conducted by the National Institute for Occupational Safety and Health (NIOSH), the Institute concludes that vibrating hand tools can cause vibration syndrome. The vibration is transmitted from work processes into workers’ hands and arms. It can be caused by operating hand-held power tools such as road breakers, hand-guided equipment such as lawn mowers, or by holding materials being processed by machines such as pedestal grinders. Prolonged and regular exposure to this vibration can affect the operator’s health, resulting in painful and disabling disorders of the nerves, blood supply, joints and muscles of the hands and arms. 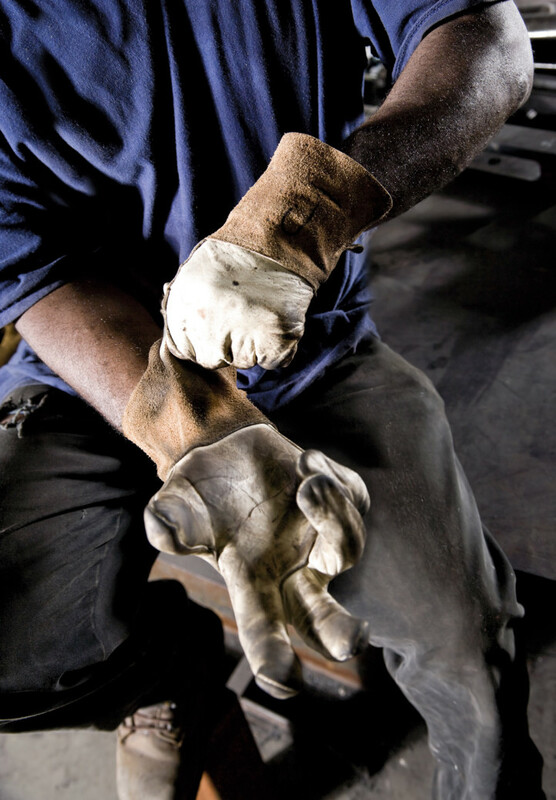 These disorders are collectively known as hand-arm vibration syndrome. Dermatitis, skin absorption, sensitisation etc. Dermal exposure is a major route of occupational exposure to hazardous substances. Different chemicals have different adverse effects on the hands and arms, from mild irritation to contact dermatitis or corrosive burns. A large proportion of the workforce may be exposed to both naturally occurring and man-made chemicals while at work. Without adequate risk assessment and controls the results of this exposure can be detrimental. In EU Member States skin diseases are the second most common occupational diseases, contact dermatitis being the most common. Other work-related skin diseases include chemical burns, contact urticarial (skin rash notable for pale red, raised, itchy bumps; they may also cause a burning or stinging sensation) and skin cancer. Lacerations, cuts and entanglement. Using mechanical equipment in the workplace can easily lead to cuts and abrasions if the correct precautions are not taken. In more severe cases ﬁngers or even limbs can get caught in equipment, leading to entanglement and even amputation. Industries most affected by this are agriculture, construction and engineering. The main PPE used to protect hands and arms is gloves. There are a number of European Standards that govern the production of gloves, such as EN 420:2003, which outlines the general requirements for protective gloves, and EN ISO 10819:1997, which covers gloves marketed in Europe as ‘anti-vibration’. The latter must carry the CE mark, indicating that the gloves have been tested and found to meet the requirements of the current standard. There are many types of gloves available today to protect against a wide variety of hazards. The nature of the hazard and the operation involved will affect the selection of gloves. The wide variety of potential occupational hand injuries makes selecting the right pair of gloves challenging. In general, gloves fall into the following four categories. Aluminised gloves provide reflective and insulating protection against heat and require an insert made of synthetic materials to protect against heat and cold. Aramid fibre gloves protect against heat and cold, are cut – and abrasive – resistant and wear well. Synthetic gloves of various materials offer protection against heat and cold, are cut – and abrasive – resistant and may withstand some diluted acids. These materials do not stand up against alkalis and solvents. Coated fabric gloves are normally made from cotton flannel with napping on one side. By coating the un-napped side with plastic, fabric gloves are transformed into general-purpose hand protection offering slip-resistant qualities. These gloves are used for tasks ranging from handling bricks and wire to chemical laboratory containers. When selecting gloves to protect against chemical exposure hazards, always check with the manufacturer or review the manufacturer’s product literature to determine the gloves’ effectiveness against specific workplace chemicals and conditions. Chemical-resistant gloves are made with different kinds of rubber: natural, butyl, neoprene, nitrile and fluorocarbon (Viton); or various kinds of plastic: polyvinyl chloride (PVC), polyvinyl alcohol and polyethylene. These materials can be blended or laminated for better performance. As a general rule, the thicker the glove material the greater the chemical resistance, but thick gloves may impair grip and dexterity, having a negative impact on safety. Butyl gloves are made of a synthetic rubber and protect against a wide variety of chemicals, such as peroxide, rocket fuels, highly corrosive acids (nitric acid, sulfuric acid, hydrofluoric acid and red-fuming nitric acid), strong bases, alcohols, aldehydes, ketones, esters and nitro-compounds. Butyl gloves also resist oxidation, ozone corrosion and abrasion, and remain flexible at low temperatures. Butyl rubber does not perform well with aliphatic and aromatic hydrocarbons and halogenated solvents. Nitrile gloves are made of a copolymer and provide protection from chlorinated solvents such as trichloroethylene and perchloroethylene. Although intended for jobs requiring dexterity and sensitivity, nitrile gloves stand up to heavy use even after prolonged exposure to substances that cause other gloves to deteriorate. They offer protection when working with oils, greases, acids, caustics and alcohols, but are generally not recommended for use with strong oxidising agents, aromatic solvents, ketones and acetates. These gloves are used for protection against electrical hazards. They are classified by the level of voltage and protection they provide. There are several factors besides glove material to consider when selecting the appropriate glove. The amount of dexterity needed to perform a particular manipulation must be weighed against the glove material recommended for maximum chemical resistance. In some cases, particularly when working with delicate objects where fine dexterity is crucial, a bulky glove may actually be more of a hazard. Where fine dexterity is needed, consider double gloving with a less compatible material, immediately removing and replacing the outer glove if there are any signs of contamination. In some cases, such as when wearing Silver Shield gloves, it may be possible to wear a tight-fitting glove over the loose glove to increase the overall dexterity. Usually it’s measured in mils or gauge. A 10-gauge glove is equivalent to 10 mils or 0.01 inches. Thinner, lighter gloves offer better touch sensitivity and flexibility, but may provide shorter breakthrough times. Generally, doubling the thickness of the glove quadruples the breakthrough time. It should be chosen based on the depth to which the arm will be immersed or where chemical splash is likely. Gloves longer than 14 inches provide extra protection against splash or immersion. One size does not fit all. Gloves that are too tight tend to cause fatigue, while gloves that are too loose will have loose finger ends, which make work more difficult. The circumference of the hand, measured in inches, is roughly equivalent to the reported glove size. Moreover, glove colour, cuff design, and lining should also be considered for some tasks. Protective gloves should be inspected before each use to ensure that they are not torn, punctured or made ineffective in any way. A visual inspection will help detect cuts or tears, but a more thorough inspection by filling the gloves with water and tightly rolling the cuff towards the fingers will help reveal any pinhole leaks. Gloves that are discoloured or stiff may also indicate deficiencies caused by excessive use or degradation from chemical exposure. Any gloves with impaired protective ability should be discarded and replaced. Reuse of chemical-resistant gloves should be evaluated carefully, taking into consideration the absorptive qualities of the gloves. A decision to reuse chemically-exposed gloves should take into consideration the toxicity of the chemicals involved and factors such as duration of exposure, storage and temperature. Disposable gloves should be changed when there is any sign of contamination. Reusable gloves should be washed frequently if used for an extended period of time. However, follow the manufacturer’s instructions for washing and caring for reusable gloves. The following can be used as checklist for training employees how to use and care for hand and arm protection. The take home message is that hand injuries can be mitigated if appropriate precautions are taken. The only way to truly manage safety risks is to engineer them out of the workplace. However, safety gloves in their various forms, such as non-slip cotton and cut and puncture resistant, are essential PPE. Gloves will reduce the risk of laceration, abrasion and puncture injuries, which based on injury statistics account for about 70% of hand injuries. Gloves offer little protection, however, against fracture or crush injuries. 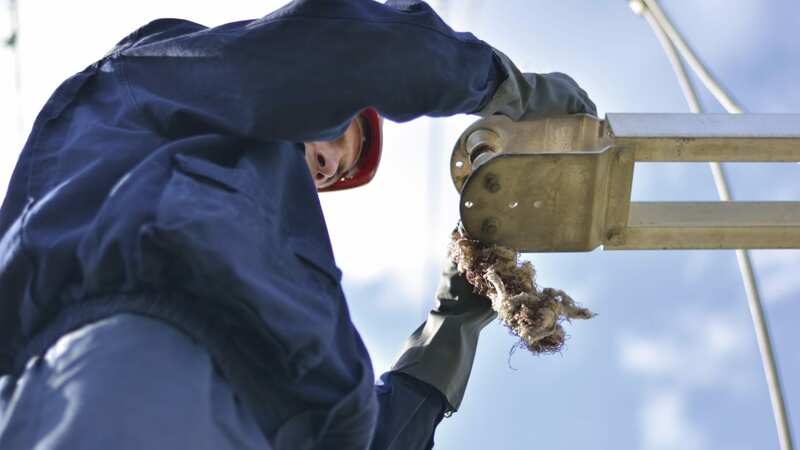 Different types of gloves should be worn to protect hands in most activities, but when there is a risk of entanglement in rotating equipment the safer practice is not to wear gloves at all, particularly loose fitting ones. Workers are encouraged to keep an eye on their hands when using tools to avoid injuries including cutting, pinching, crushing and burning. They are advised never to place hands near lifting points or between a load and a fixed object.